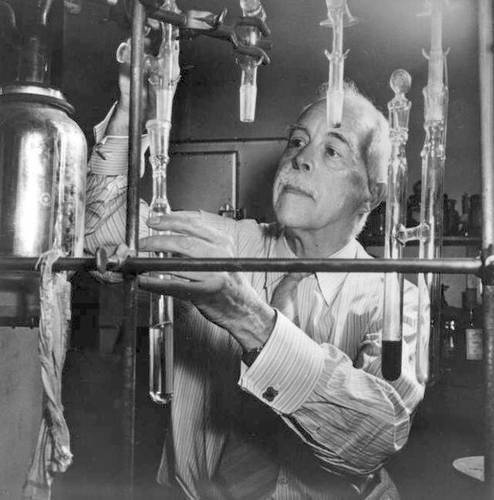 Gilbert N. Lewis (1875-1946) was an American physical chemist. His work with heavy water and resources were adapted by Ernest Lawrence in the development of the cyclotron. Lewis made many contributions to science. He was nominated for the Nobel Prize 41 times, though he was never awarded the prize. He discovered covalent bonds and electron pairs. He worked with isotope separation, and became the first person to purify a sample of heavy water. The heavy water was later used as projectiles in Lawrence’s 27-inch cyclotron. He also made contributions in ideas on relativity and acid-base reactions and coined the term “photon” as the smallest unit of light. 1875 Oct 23rd Born in Weymouth, Massachusetts. 1899 Received his Ph.D. in chemistry from Harvard University. 1912 Joined the faculty at University of California, Berkeley as a dean of the College of Chemistry.